Our parade of Christmas treats wouldn’t be complete without a fruit cake recipe! 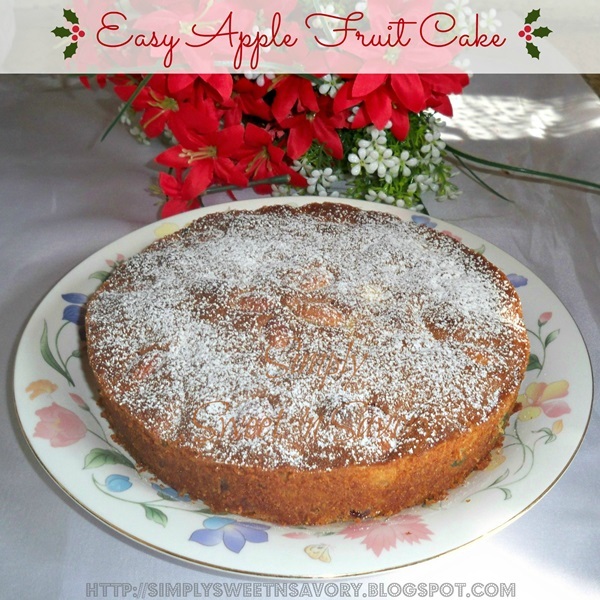 Today’s guest is Ambreen from Simply Sweet ‘n Savory and she is sharing her Easy Apple Fruit Cake! Sounds delicious! Hi Simply Sweet Home readers! My name is Ambreen and I share my favorite sweet and savory recipes at “ Simply Sweet ‘n Savory .” Thank you Jerri for giving me this lovely opportunity. I am so excited to be here, sharing a Christmas treat with you all. Fruit cake is very popular in my family and I make it quite frequently. Today, I’m sharing an easy apple fruit cake recipe ( adapted from BBC good food ) which is packed with apple chunks, candied fruits and raisins. This simple, light and delicious cake is perfect for the holiday season or any special occasion.